WASHINGTON — NASA field center directors and missiondirectorate chiefs will report directly to NASA Administrator Charles Boldenunder organizational changes Bolden announced Feb. 23 in a memo to senioragency officials. The heads of NASA's 10 regional field centers and fourheadquarters-based mission directorates currently report to NASA AssociateAdministrator Chris Scolese, the agency's third-highest-ranking official. Thatreporting structure was put in place by Bolden's predecessor, Mike Griffin. Scolese will continue to be responsible for "integrating thetechnical and programmatic elements" of the agency, but NASA center directorsand mission directorate chiefs "will report directly to the Administratorrather than through the Associate Administrator," said Bolden's memo, a copy ofwhich was obtained by SpaceNews. "While Center Directors do not hold programmatic budgetauthority they are responsible for providing support and guidance to programsand projects in resolving technical and programmatic risks," Bolden wrote. "Iexpect Center Directors to proactively work with the Mission Directorates,programs, and projects to find constructive solutions to the problems wediscover. This requires access and depth of penetration into mission programand project management. The Center Directors are expected to address this needwithin the Center's operating framework." The roles and responsibilities of NASA's four missiondirectorates — Aeronautics, Exploration Systems, Science and Space Operations —will not change, according to Bolden. The Office of Program Analysis & Evaluation, a Griffin-era creation, will be renamed Independent Program and Cost Evaluation. 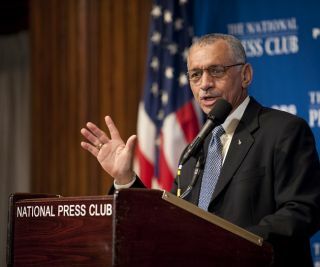 The Office of Strategic Communication will be disbanded and the heads of NASA's legislative and intergovernmental affairs, education and public affairs departments will report to Bolden. A Mission Support Directorate will be created and put under the direction of an associate administrator — reporting to Bolden — who will be responsible for operations management, construction of facilities and infrastructure funds. The Mission Support directorate will absorb many of the functions of the Office of Institutions and Management, which will be disbanded. Bolden said the headquarters changes should be completed bylate March and the field center changes by late April. "These changes will strengthen NASA's capability tosuccessfully execute our programsand projects," Bolden wrote. "I look forward to working with a moreintegrated team and functioning together to advance our Nation's goals on Earthand in space exploration for the benefit of humanity."